At 13, the Southbridge resident is one step away from the game’s highest title. THE PIECES are being shuttled across the chessboard at blinding speeds. Sitting at the table, without an opponent, Sam Sevian moves them all, white and black, and does so without a moment of hesitation. When a piece is captured, he topples it hard to the board and ejects it briskly from play. The 13-year-old is re-creating from memory a game he played earlier, something he and virtually all elite chess players do constantly. There is always plenty to be learned from a previous contest, no matter the outcome — which, in this case, was a win for Sam. So he reviews all the moves, eventually reaching the point when he feels he secured the game. “Now it’s over,” he says softly. “He played desperate.” This confidence is hardly out of character for someone his age. 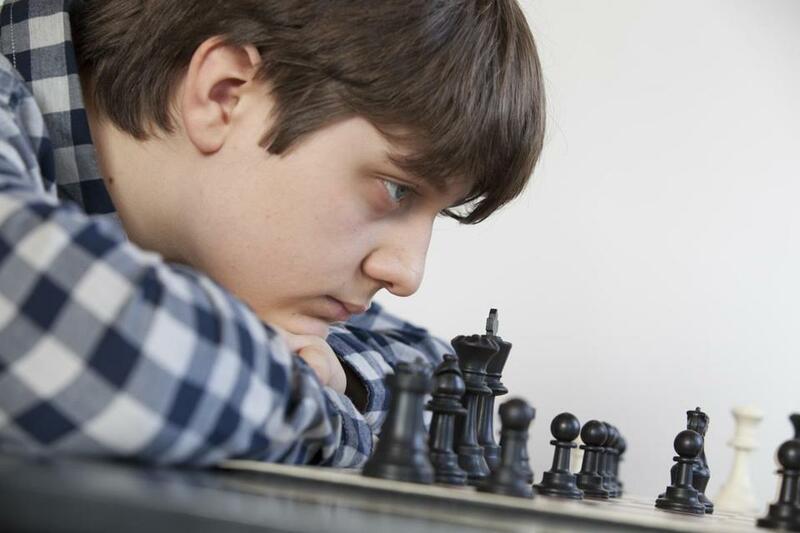 What makes Sam Sevian different from his peers is that he can play chess better than any other 13-year-old in American history. Last November, a month before his birthday, the Southbridge resident earned the title of international master. He’s the youngest American player ever to attain that second-highest title in chess, besting the mark set in 2008 by Ray Robson, then 13. Bobby Fischer, the gold standard of American chess, didn’t reach the international master level until he was nearly 15. Now Sam has set his sights on becoming a grandmaster, the game’s highest title. A few more tournaments like the recent Foxwoods Open, in which he placed second against a strong field, and he’ll reach his goal relatively soon. 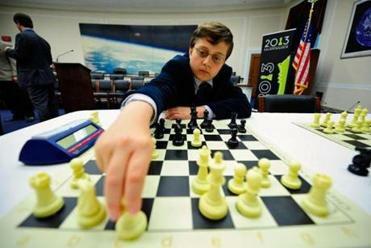 He is also bidding to become the youngest grandmaster ever to play for the United States, a milestone held by Robson, who earned the title two weeks before his 15th birthday. With more than a year and a half left to accomplish the feat, Sam is almost a shoo-in to do it, likely with time to spare. The gameSam is so effortlessly simulating on this afternoon in March was one of his most impressive victories, his January 26 takedown at the Foxwoods tournament of 46-year-old grandmaster Alexander Shabalov, a four-time US National Chess Champion. Sitting in front of a chessboard in the sun-splashed main room of Providence’s Chess Master Connections, one of the most prestigious clubs in New England, the young star recalls with pinpoint precision the game’s entire 40-move sequence. Sevian attends a special event in Washington, D.C., held last April at the US Capitol building. The dizzying recap is impossible for a novice to understand. But according to Jorge Sammour-Hasbun, owner and lead instructor at the Providence academy and club, newbies aren’t the only ones confounded by the way Sam plays. Sammour-Hasbun believes Sam’s brilliance just might be unparalleled. “Pretend that the guy’s got a PhD in math from Harvard, at his age. That would be the equivalent of where he is right now,” he says. Sam Sevian has already taken on the world and won. In November 2012, he earned the gold medal in the Under 12 Open section of the World Youth Chess Championships in Slovenia. At 13, he is already the world’s 85th-ranked junior, a group encompassing all players under age 21. He’s the the world’s top rankedplayer in the under-14 division. Does the young mastermind have a weakness? “Sometimes I think too much,” he says with a smile. Matikozyan lives in Los Angeles and now mostly coaches Sam via Skype three or four times a week. He was able to see his young pupil more often when the Sevian family lived in Santa Clara, California. Sam’s father, Armen, is principal scientist for a laser manufacturing company, and over the 13 years of Sam’s life, Armen’s career has taken the family from Sam’s birthplace of Corning, New York, to Orlando and Los Angeles and Santa Clara and finally Southbridge, where they moved last July. According to Armen, who, like his wife, was born and raised in Armenia, Sam’s burgeoning chess career played a significant role in the family’s latest relocation. Sam has done nothing but grow, chess-wise, since his father first taught him the game at age 5. Armen spotted his son’s talent instantly. And given the popularity of the game in his native land and his own stellar chess background, he was more than happy to encourage his son’s development by playing with him regularly. Armen, who once carried candidate master title in the Soviet chess system (about two levels below Sam’s), still takes on his son occasionally. These days he defeats Sam “once in a blue moon,” he says. Since the move to Massachusetts, Sam has been home-schooled, although that is not his parents’ preference. His 11-year-old sister, Isabelle, goes to school in Southbridge, and when the family lived in California, Sam attended school. But these days, his demanding chess schedule would force him to miss too many days — an estimated 45 to 50 absences. He’s most at home at a place like the chess club in Providence. Or in one of the many tutorial sessions hosted by the Kasparov Chess Foundation. Sam and his father credit the foundation, created by chess legend Garry Kasparov, with being instrumental in Sam’s development. In 2012, Sam was accepted into the foundation’s Young Stars program, giving him the chance to train personally with Kasparov twice a year, in St. Louis during the summer and New York during the winter. Kasparov started his foundation to help foster the growth of the game in the United States. Even though there is no shortage of brilliant prospects in clubs across the country, few players are able to afford the proper coaching fees and the travel costs to the elite tournaments. Sam and his parents are not immune to the financial demands of the game. Though high finishes bring prize money, Sam is lucky to break even after expenses at many tournaments (his second-place finish at the Foxwoods Open earned him $2,000). Despite his big victory in the World Youth Championships two years ago, Sam might actually skip the tournament this year, due to the cost of travel to South Africa. HAVING FINISHED reenacting his game against Shabalov, Sam has arranged to face the 35-year-old Sammour-Hasbun in a few rounds of blitz chess, where each player has a set amount of time, usually around five minutes, to complete all moves. Though he’s currently a master, one level below Sam, Sammour-Hasbun won a championship in this discipline in 2007 and 2008 and is likely to provide a challenge. So far today, the players at Chess Master Connections, many of them younger than Sam, have largely ignored the 13-year-old champion in their midst. They’re too busy with their own games. But when the prodigy sits down to take on their teacher, a number of them abandon their matches to watch the battle in CMC’s long, narrow side room. Both clocks are set for five minutes and after a quick handshake, the game is on. The first few moves take place in rapid succession, but it isn’t long before each player meets a roadblock and pauses to ponder his course of action. The two don’t make eye contact as they study their predicaments. Each has a hand pressed to his chin as he looks at the board. Under the table, each jiggles a leg intensely. At times, it seems as though both might jump out of their seats. 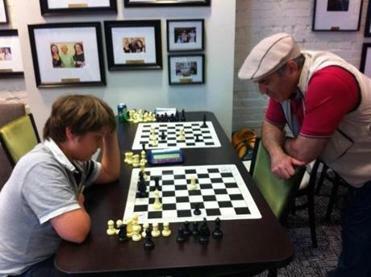 Sam trains with chess legend Garry Kasparov as part of the Kasparov Chess Foundation’s Young Stars program. The onlookers congregated in the tight space around the opponents don’t make a sound. Sam is able to resolve his dilemmas a bit more quickly than Sammour-Hasbun and takes a 30-second lead on the clock. On the board, however, the game is proceeding evenly. It goes on this way for a while before Sam begins to pull ahead. Not because he’s capturing the most pieces, but because his pieces are more centrally positioned, while several of Sammour-Hasbun’s key pieces are stuck on the side of the board and effectively out of play. “Jorge’s going down,” one of the kids whispers. Time is running out. With less than 30 seconds remaining on Sammour-Hasbun’s clock, the instructor begins making moves as quickly as he can. Sam matches the torrid pace, and together they put on a remarkable show. In an almost perfect tempo, they move their pieces and smash their timers. A particularly chaotic four-second stretch sees them make four moves apiece. Sam is getting the better of play, but it no longer matters. Sammour-Hasbun’s clock hits 0:00 first, making Sam the winner. The crowd breaks up, leaving the combatants to the post-game analysis. Really, this is what it’s all about. To players like Sam and Sammour-Hasbun, the game, in some ways, is secondary. Sam might have won, but it doesn’t matter, since the match won’t count toward his official rating. What he wants is to talk it out with Sammour-Hasbun. They begin to reenact the game, discussing the moves they made and the moves they might have made. Several minutes in, Sammour-Hasbun pauses to assess his situation. His knight, rook, and bishop, three pivotal attacking pieces, are stranded on opposite ends of the board. “Maybe this is even better,” Sam says, proposing an alternative. Sammour-Hasbun takes a few seconds, trying to shoot down Sam’s suggestion, but can’t. “It might be,” he admits. The simulation proceeds, and Sam continues to scatter the pieces about at a pace far exceeding Sammour-Hasbun’s, causing the former champion to shake his head in mock frustration. The boy can’t help himself. While Sammour-Hasbun is still dwelling on his last move, the kid sitting across the table keeps his blue eyes fixed intently on the board, reviewing the possibilities before him. He knows exactly what he’ll take next. Joe DePaolo is a writer in New York City. Send comments to magazine@globe.com. Correction: Because of a reporting error, this story used some chess terminology incorrectly. Master, international master, and grandmaster are titles. In addition, some chess games were incorrectly called matches.